Cheers, see you on the 9th. C2CTC take 2 just now, again mostly r24. 2k total work distance in 6:36.5. 1:39.1 average pace. I added 45' UT1 work on the semi-recumbent stationary cycle @ an average 259 watts, HR average about 122 bpm. Meh. 4k total work distance in 13:20.8, 1:40.1 pace, 349w. Getting a little of the mojo back. I added 45' UT1 work on the semi-recumbent cycle. This worked out nearly exactly the same as yesterday: average HR was 1 bpm higher, as was peak HR. Average wattage was 259, again. Some days you're the pigeon, some days the statue. Today I was statuesque. I sat down, warmed up, and plugged in a 2k test piece. Away I went. At about the 720m mark the fcuking monitor froze up. I >think< it was because I was synced to ErgData and I got an SMS from T-Mobile/Poland in the middle of the row. The screen kept telling me it was saving the workout, but none of the buttons on the PM5 were functional. I ended up removing the batteries briefly to reset the damn thing. Okay, equanimity ruined. What can I do instead of a 2k I'm now totally mentally unfit for? Of course, a CTC. I set that up, do the first 500m piece in 1:34 flat r36 and am on 1:35 or so with 500m to go in the 1250 when -- wait for it -- the monitor/ErgData combo freezes again. FCUK AND A HALF. Hahaha. One of those days!!! 2k total work distance in 6:29.8, 1:37.4 pace per the PM5. I added 45' on the semi-recumbent cycle @ 277 watts. UT1 work: HR average 128 bpm, peak 143 bpm. Cadence around 43 rpm. UT1, working out to about 70% of age-group 2k WR watts. Meh. 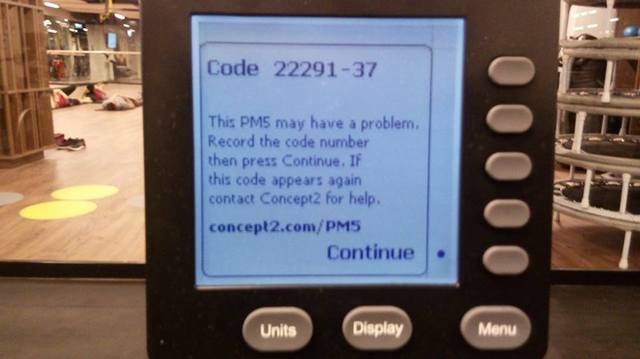 Another frustrating workout with the combo of ErgData and a PM5 version 25.1. The system recorded the same HR of 144 bpm from the 47 second mark to the end of the piece. That consistency did >not< happen and could not have happened. I have no idea what the problem might have been, Unfortunately it not only persisted, it got worse. I gave up after 4 reps at what theoretically was 1:43.1 pace, but felt much harder, and went over to the semi-recumbent cycle. I added 30' at 288w. More PM5/ErgData foofah to report. I have no idea what the error code actually signifies, as AFAIK C2 has not published most of them. 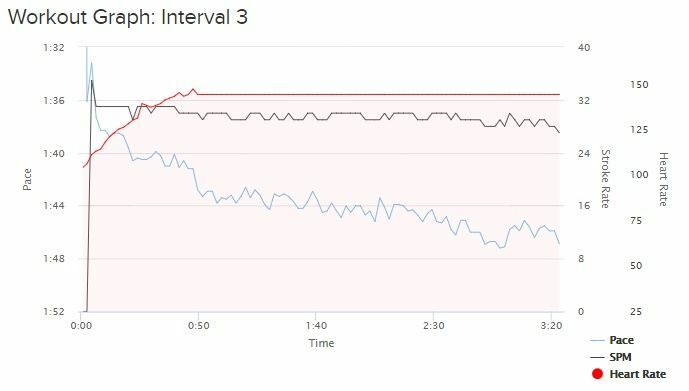 I do know that it totally ruined yet another attempt at an interval workout using ErgData. I have written C2 support with screenshots in an attempt to find answers/a workaround. I suspect there may well be radio interference with the Wi-Fi and/or ANT+ connections between the HR belt, PM5, and android phone I'm running ErgData on. If that's the case, the simplest solution is a hard cable connection between the monitor and the phone. I did not feel like starting over, so I switched over to the semi-recumbent cycle and put in 90' at 268 watts. HR for that averaged 118 bpm with a peak of 132 bpm only because I upped the cadence in the last 5 minutes from 42-43 to about 55 rpm. This further casts doubt over the idea that yesterday I was somehow hitting 170 bpm at the end of a 1k interval piece @ 1:42 and change. Um, NFW. Either I was much faster than the pace reported by ErgData or my HR was much less than the rate reported by ErgData or both. Le sigh. You need to ask the gym to update the firmware on the PM5. That either needs the laptop and a printer cable or the firmware on a USB stick. Takes about eight minutes per ergo. It's the latest firmware release, Dougie. I've been exchanging emails with C2 about the problem. Evidently the error code has to do with an insufficient data-transmission rate over Wi-fi. This may well be due to radio interference in the gym area. The wonky stroke data reported by ErgData is evidently from a different problem area, an Android bug they know about and are working on for the next release. 9 x 1:30 r32 on 1:30 rest this morning, working on rating discipline. 4130m total work distance in 13:30.0 net elapsed work time, 1:38.0 pace, 372w r32 [PM5]. On the sports front, by chance we happened to be staying at the Hilton Prague. It turned out to be hosting as well the 2017 General Assembly of the Association of National Olympic Committees, starting tomorrow. Let's say that the quality of the punters in the hotel gym was somewhat higher than usual. The Hilton also has 2 model C ergs with PM5s, if anyone reading this needs an erg fix while in central Prague. On Friday I did 9 x 1:30 r32 on 1:30 rest in 1:36.4 average pace. I forget what I did Saturday. I managed 8 x 1:30 r32 on 1:30 rest on Sunday, I think in 1:38.3 with the last at 1:32.7 pace or so,. Meh. This is an excellent set the likes of which I will never do again in my remaining life. But what I find even more extraordinary are the cycling sessions of 45 mins at 277W with that low of a HR. Even at peak cycling shape in younger days I would not have been able to duplicate it. So I resolved to do an experiment on the bikes at the local gym. Since I don't like a cadence of 41 sitting I tried that standing which is akward on the electric bikes. But most akward was the fact that I had to max out the bike at 600W (LOL) to reduce the cadence to 50 and even then I had to lean on the handle bars to reduce the weight on the pedals. In this very akward position (due to the inept proportions of the bike) I hung with it for 2 mins. On a real stationary bike I could do this resistance for 10 mins without problems. Estimated true Watts: 250 (at most). does not measure the power output correctly when standing at a cadence of 50. My situation is special since I set the power output to 600W and this is what the monitor continued to show (but not what really happened). and maybe that throws them off. Think of some experiments to test your situation. 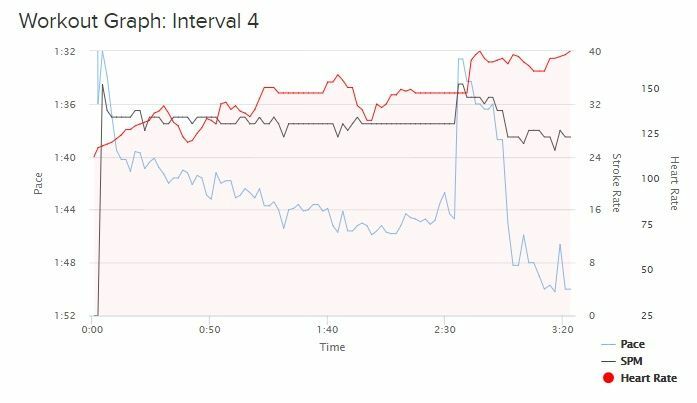 What happens if you increase the cadence (still setting power output to 275W)? If this cycling is real you are in unbelievable shape especially when combined with the more anaerobic power on the rower, sub 6:30 in my opinion. Cheers, I think the reported power output is probably reasonably accurate. It's a top-end TechnoGym reclining cycle, and they claim something like +/- 2% wattage accuracy. Certainly the 'feel' during and after one of those longish power sessions is comparable to, say, 20 spm rowing on a C2 at similar wattage. So is the puddle of sweat. I attribute the significantly lower HR on the cycle to a combination of posture (in particular, my back is supported) and to the fact that I'm not using or particularly moving my upper body and arms to generate power. Changing the cadence does affect the calculated wattage. However there's an automatic compensation mechanism that adjusts the resistance when the cadence changes. I think the maximum possible output on one of the bikes is something like 488 watts. I couldn't come close to that legs only on the reclining bike, but can do it for several minutes on an ergo (it's 1:29.5 pace). What have you been doing during your retirement from rowing to be at that level? I hope you have a perfect day at BIRC. If all the pieces fall together this will be a good one. I didn't retire from rowing, I just stopped posting in this Forum. Unfortunately, last March I contracted a permanent case of severe, steroid-induced type II diabetes. This has forced me to make drastic changes in diet and also exercise habits. So far they've had positive effects.